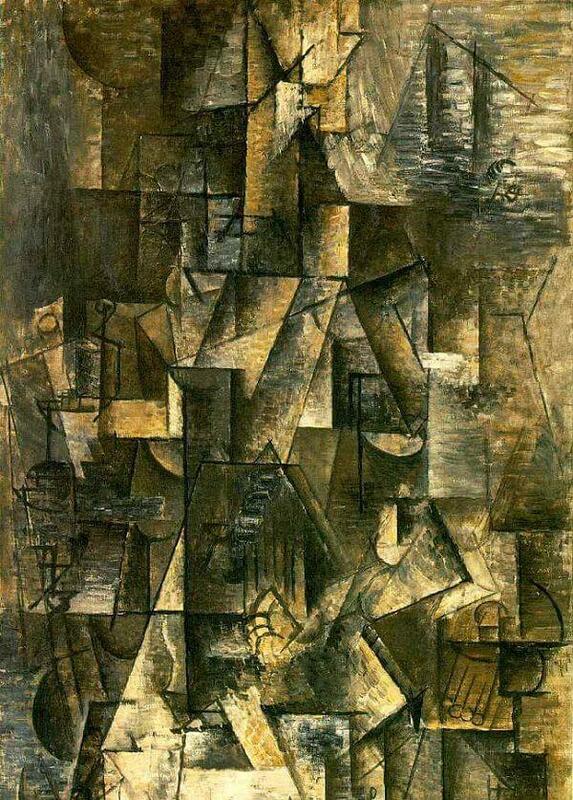 Ma jolie (My pretty girl) was the refrain of a popular song performed at a Parisian music hall Picasso frequented. The artist suggests this musical association by situating a treble clef and music staff near the bold, stenciled letters. Ma jolie was also Picasso's nickname for his lover Marcelle Humbert, whose figure he loosely built using the signature shifting planes of Analytic Cubism. This is far from a traditional portrait of an artist's beloved, but there are clues to its representational content. A triangular form in the lower center is strung like a guitar; below the strings can be seen four fingers; an elbow juts to the right; and in the upper half, what may be a floating smile is barely discernable amid the network of flat, semitransparent planes. So although the figure appears to disappear into an abstract network of flat, straightedged semitransparent planes, together these elements suggest a woman holding a musical instrument. Thus it manages to be both a representative piece of high Analytic Cubism, while at the same time representing a very traditional theme. In Cubist works of this period, Picasso and Georges Braque employed multiple modes of representation simultaneously: here, Picasso combined language (in the black lettering), symbolic meaning (in the treble clef), and near abstraction (in the depiction of his subject).